This beautiful Lagoon 42 catamaran in Croatia will allow you to sail to the north and the Kornati Islands or to the city Biogard or Zadar. The rental of this Lagoon 42 catamaran in Trogir, in the suburbs of Split and a few kilometers from its airport, will allow you to discover the beauties of the Adriatic Sea. If you decide to sail south, you can visit the historic city of Split, the Dalmatian islands like Hvar or the famous city of Dubrovnik. The catamaran Lagoon 42 combines elegance and functionality thanks to the natural light in cabins with large windows and the comfort of large double beds. With 12 passengers on board, 4 cabins, front spikes and lounge, it has state-of-the-art equipment in electronics, kitchen and audio. This catamaran is available for yacht charter with a base price of 3 520 € (approximatly 3 970 $). 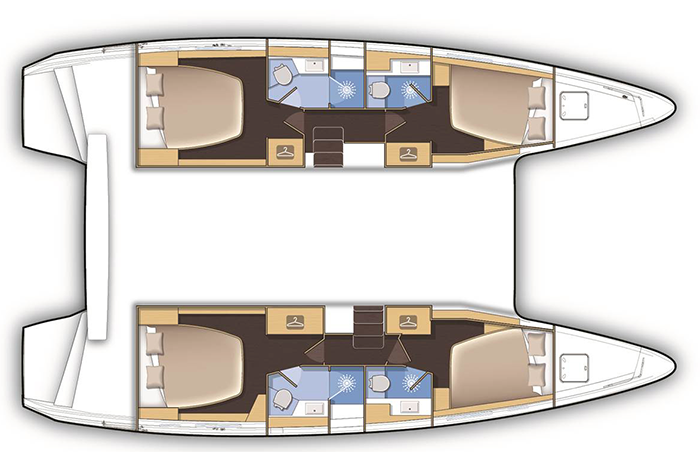 boat Lagoon 42 Lagoon Catamaran yacht charter reviews : 5 out of 5 based on 1 rating. 1 user reviews. Have booked with Windward (Barry is my go to person there) on many trips from Asia, Europe and all over the carribean. He’s been a great source of knowledge and also someone who has been able to negotiate really competitive prices. Strongly recommend him!